Attending the 76ers event were, from left: back row, Edward Deleon, Lauren Moon, Brayden Ostan, Tristin West, John Krytsis, Educational Lab Specialist Chelsea Wootten, Lester Fair, Jana Ruark, Carson Williamson, Kylie Brown and Howard Mumford; front row, Safi Furlow, Department Chair Rob Rector and instructor Jessica Farley. 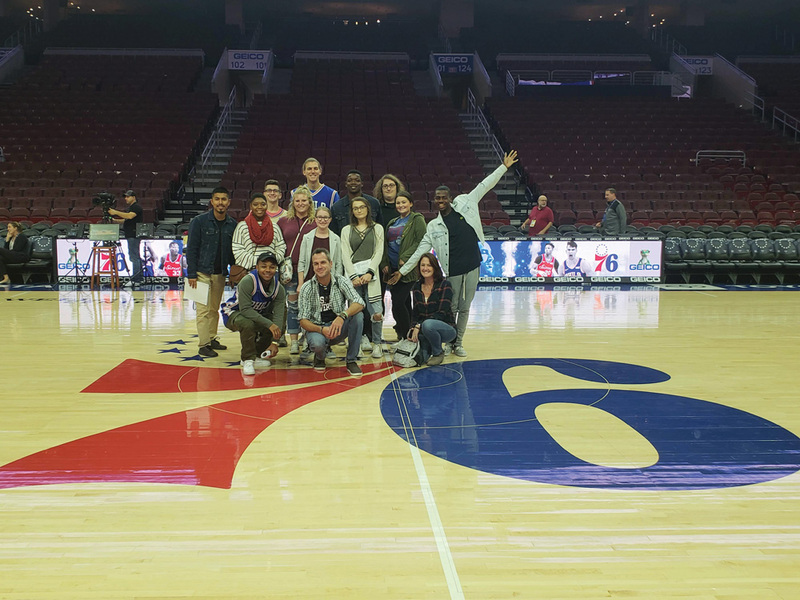 Students from Delaware Technical Community College’s Communications program were recently treated to an exclusive tour of the in-house marketing and broadcasting areas of the Philadelphia 76ers. The tour was presented by Wyatt Yearout, media relations associate for the 76ers, who led the students through the various jobs and responsibilities of the internal public relations department of the basketball team. Inside the Wells Fargo Center, they were treated to a sneak peek at the team’s new uniform design, a tour of the press room and marketing areas, and even a walk onto the court before the team’s pre-game practice. “It was really interesting to see how many moving parts there were to the organization,” Moon said. She added that all those moving parts also meant opportunities for students within the program. The Wells Fargo Center in Philadelphia is home to the 76ers basketball team, Flyers hockey, the Philadelphia Soul arena football team and the Philadelphia Wings National Lacrosse League team. It also hosts NCAA basketball, as well as several big-name concerts throughout the year. After the tour, the students stayed to watch the ’Sixers defeat the Los Angeles Clippers. For more information about the communications program, visit dtcc.edu/programs.